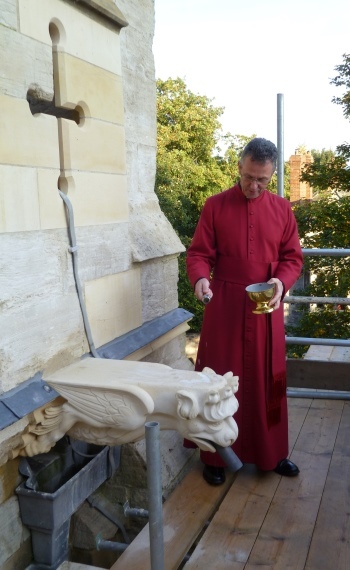 Dean of Ripon Cathedral the Very Revd John Dobson blesses one of the new gargoyles. The original gargoyle retained much more legible stonework than the other two which were replaced, making this a particularly demanding commission for stone carver Martin Coward. He was tasked with producing a design that would reproduce the original gargoyle and inventively extrapolate the missing features. In 2015 Ripon Cathedral carried out a programme of stonework repairs funded through a grant from the Cathedrals Fabric Commission for England’s (CFCE) First World War Centenary Cathedral Repairs Fund. A modest but compelling component of the programme was the replacement of three gargoyles on the north elevation of the presbytery aisle, in bays which survive from the late 12th century. these relict stones were the focus of a competition to select carvers to design and carve replacements. 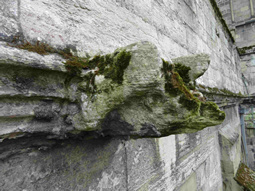 A third gargoyle was later added when, on close inspection, it too was discovered to be beyond repair. This article focusses on the competition and aims to provide a case study for commissioning works of this type to identify and nurture carving talent. There has been a church on the site of Ripon Cathedral since 672AD. Archbishop Roger de Pont-l’Évêque started rebuilding in the late 12th century. The Early English west front was commenced in the early 13th century, while the north presbytery was partly rebuilt in the late 13th century. Major repairs were required when the central tower partially collapsed c1450, and in 1660 the central spire collapsed, prompting major rebuilding of the presbytery and south transepts and the removal of the west spires. Restoration and re-ordering work was carried out in the Victorian period, most extensively by George Gilbert Scott, and further conservation and repair continued in the 20th century. Some of this Victorian and later work is of the highest quality and invention, defining aspects of the current character of the cathedral. It includes some very strong, wonderfully grotesque gargoyle replacements. The surviving 12th-century fabric was of particular importance for its ground-breaking use of architectural forms. It was contemporary with the new work of the Canterbury Cathedral choir following the 1174 fire and exemplifies the development of early Gothic in the north of England. This north east portion of the cathedral is therefore of the highest national significance. Gargoyles (the name comes from the Latin gargula, meaning throat) were introduced to medieval cathedrals from around 1200. As well as their practical purpose – to throw rainwater clear of the masonry walls – they may have been intended both as a visual reminder of the presence of evil and to scare evil spirits away. 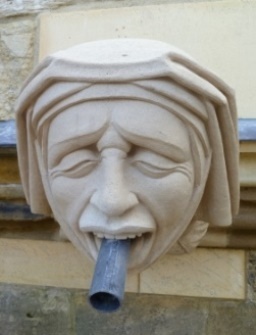 At Ripon, gargoyles continue to be important functional components of the cathedral’s rainwater disposal system, in some cases incorporating lead pipes that discharge overflow water from the gutters. In preparation for this project, cathedral archaeologist Liz Humble provided an invaluable gazetteer of the cathedral’s gargoyles. Her report revealed that our three gargoyles probably dated from the late 13th or early 14th century. As work progressed on site, further archaeological evidence helped us settle on a more confident dating of early-mid 14th century for the parapet above, so the gargoyles are therefore of or around this period. Being among the few remaining pre-19th century examples on the cathedral, their remnants were of such significance that very careful thought and preparation was clearly warranted for this project. 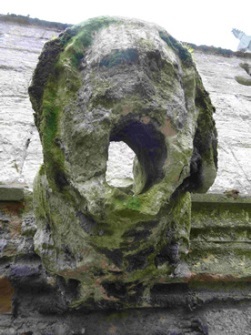 It was during the development of a stonework conservation policy for the cathedral in late 2014 that it became clear that the remnants of two of the gargoyles were illegible and beyond repair. In consultation with the fabric advisory committee (FAC) and the CFCE an application was made to create two new works of art which would be sympathetic to the history and style of the building and which would convey the spirit and intent of the original stone carvers’ work, allowing our new artists some freedom of expression. The original intention of the architects, builders and sculptors will be respected by ensuring meticulous replication of original design where replacement is the only option and there is clear evidence to reconstruct the detail. By such means the new stone, although not medieval in origin, will continue to carry important information about the design, both for the viewer and for those who will care for the building in the future. The successful grant application for funding gave the essential impetus for a repair programme that was deemed ‘urgent’ in the 1998 quinquennial. With the support of the dean and chapter and FAC, and encouraged by Ripon’s energetic director of operations Julia Barker, the decision was then taken to launch a competition with the express aim of identifying and nurturing talented craftspeople for this commission. The first step was to obtain Care of Cathedrals Measure approval to replace the gargoyles. The application for consent included an artistic brief and the terms of the competition, so that the CFCE could have confidence that the process would deliver work of the highest quality. The selection process was directed as widely as possible to stone carvers working in the UK, whether freelance or in commercial or cathedral employ, and the competition was promoted to City and Guilds alumni. The winners were given the option to work either in their usual workplace or in a carving workshop at the cathedral. An invitation was issued seeking expressions of interest from skilled, experienced UK-based carvers with a recognised qualification or demonstrable equivalent experience. Entrants were asked to include their CV and a copy of an original design for a piece of figurative free carving, with photographs of the finished artwork. Finally, they were asked to submit a short statement of their approach to designing and creating a new gargoyle for Ripon. The aim of the initial selection round was to have a light touch and not be overly burdensome, and to ensure that the six selected competitors (who would be paid) were of commensurate standard. Those expressing interest also had to confirm that they were able to meet project deadlines. 1) The newly commissioned gargoyles will read as new additions to the cathedral and are not aiming to directly reproduce or create any kind of pastiche of the work of the original craftsmen nor recreate the patina of great age. 2) We recognise and accept that where decorative features are unrecognisably lost, these were both functional and works of creative expression and should be renewed in equally energetic carving. 3) Designs for the new gargoyles should resonate, and not be out of keeping with, the other surviving gargoyles at Ripon, as pictured in the gazetteer. 4) The new designs should take account of the clearly identifiable principles of medieval Gothic art and architecture, and be sympathetic to the design intent of the medieval craftsmen. We are looking to embrace and celebrate the animated, the grotesque, the expressive, inspired both by the natural world and also what is fantastical. 5) The new gargoyles will be modelled from the surviving fabric, so that the fundamental root of the new work echoes the existing: this is the only artistic constraint that we impose. Otherwise the carver is free to invent the subject and identity of the new work. Our competitors had to provide a drawing at half full size showing their design seen from at least three orthogonal projections (from below and two sides) or photographs of a maquette fulfilling the same requirements. All shortlisted entrants were also asked to provide a single sheet of working sketches. Designs were to be accompanied by a written statement describing how the entrant hoped the design would be appreciated by the viewer, and explaining the design influences and why the designer felt the gargoyle would belong at Ripon Cathedral. A guide price of £5,000-10,000 was given and entrants were asked to provide a tender price for all work and expenses (including insurance) but excluding the cost of the stone and its transportation. A £250 honorarium was paid for each of the six competition designs plus travel expenses for visits to Ripon. Entrants were also given closely defined technical parameters for their work (stone, sizes and fixing). Interestingly, the carvers’ designs challenged the boundaries imposed by the architect’s block-sizes. For example, the retching ‘sick woman’ design (above) needed to reach upwards above the string course to be properly visible from the ground, while the bat design (below) had claws that dropped below the string course and ears that reached upwards. Tom Nicholls’ bat gargoyle and the relict stone it replaced. The new design was inspired by Daubenton’s bat, a species which is prevalent in the local area. The expert judges also provided mentoring and oversight, for example ensuring that the designs were suitably robust and weather-resistant, and we encouraged conversation between our winners so there was a degree of design harmony between them. The six design entries were displayed at the cathedral along with information about the project. The competition was then judged by the dean (the Very Revd John Dobson), the cathedral architect (Oliver Caroe), the chair of the cathedral FAC (Cllr Mick Stanley), a representative member of the CFCE (Ulrike Knox, also a member of the FAC), and two stone carvers (Rory Young and Tim Crawley). providing a well-considered programme to meet the project deadline, including time for liaison with the commissioners (5). Two winners were announced at the Ripon Cathedral Festival in early May 2015. They were Alan Micklethwaite with a design for the ‘sick woman’ gargoyle and Tom Nicholls with a bat gargoyle (inspired by the locally prevalent Daubenton’s bat). Martin Coward came a very close third. Their success was hard won, given the quality of the other competitors. The need to replace the third gargoyle was recognised shortly after the competition. As sufficient grant funding remained, a commission was also awarded to Martin Coward. Compared to the relict gargoyles, the third retained a lot more legible stonework so Martin was asked to produce a design that would reproduce the original gargoyle and inventively extrapolate the missing features (top illustration and design drawing below). Stone blocks (each approximately 1.5m in length and weighing around 1.2 tonnes) were selected and prepared by the cathedral masons, then delivered to the carvers. Six months later all three had been completed and lifted into position. They were unveiled when all stonework repairs were complete and the scaffolding was removed in late November 2015. The competition for commissioning the new gargoyles for Ripon was a great success and highlighted how much can be achieved in a relatively short timescale. The UK is blessed with a wealth of design and stone-carving talent, which this competition highlighted and tapped into. Because the third gargoyle retained a lot more legible stonework (below), Martin Coward was asked to produce a design (above) that would reproduce the original gargoyle and inventively extrapolate the missing features. Providing a clear brief and guidance to candidates at both stages of the competition was essential to its success, as was the wisdom and support of expert judges who were able to assist and guide at both the initial shortlisting and in the final selection. Clear assessment criteria were also crucial, ensuring a fair and transparent selection process. Having one person – Oliver Caroe’s colleague Caroline Sones – assigned to collate all of the entries, liaise with the entrants and ensure compliance with the competition requirements was invaluable. In the assessment process we tested both for ‘hard’ skills (technical design and carving experience) and softer skills (communication, organisation and essential inventiveness) in order to be confident that those selected would be able to manage the project effectively and deliver to the tight timescales. Payment of a modest honorarium to all of the shortlisted entrants served to acknowledge their part in this creative process and helped to enable a high standard of design for each of the gargoyles. Public engagement with the project was encouraged and the display of competition entries at the festival attracted considerable interest. 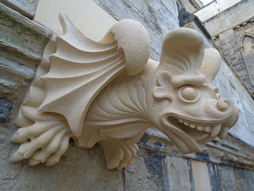 Julia Barker’s cathedral blog provided progress updates once work on the gargoyles was under way. A short time-lapse video of Alan Micklethwaite’s carving captures in five minutes two months of hard work. It is a delightful and expressive film: the tools seem to dance, the sunlight and shadows skim around the workshop and the ‘sick woman’ emerges, almost magically, from the stone block. In addition to completing essential repairs and exemplifying the skills of a new generation, competitions like this stimulate and support the UK’s heritage craft skills, and it is hoped that other well-managed competitions might follow. OLIVER CAROE BA DipArch(Cantab) RIBA AABC is director of Caroe Architecture Ltd (www.caroe.com) and has been architect to Ripon Cathedral since 2009. LIZ HUMBLE BA(Hons) MA MCIfA IHBC is the principal at Humble Heritage (www. humbleheritage.co.uk) and consultant archaeologist to Ripon and Sheffield cathedrals.